Ms Sarah Sewall, the US Under Secretary of State for Civilian Security, Democracy and Human Rights. 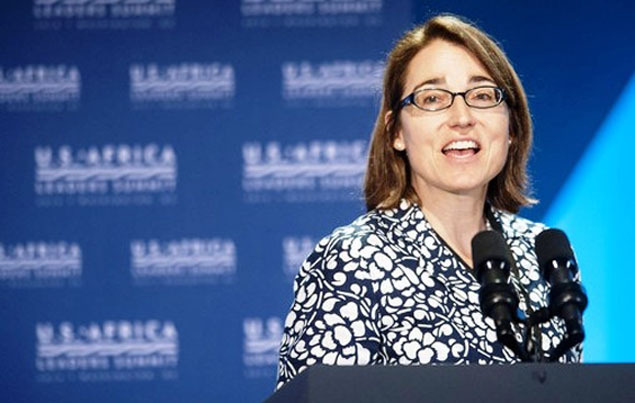 She also serves as the US administration’s Special Coordinator for Tibetan issues. (TibetanReview.net, Nov20, 2014) – Ms Sarah Sewall, the US Under Secretary of State for Civilian Security, Democracy and Human Rights, has announced a $3.2 million aid for a Health System Capacity Strengthening Project for Tibetan refugees in India and Nepal during her visit to Dharamshala, India, the seat of the exile Tibetan administration, over Nov 15-16. The project will increase access to quality preventive, primary, and secondary health care for Tibetan refugees. Ms Sewall also serves as the US administration’s Special Coordinator for Tibetan issues and visited the Tibetan communities during her visits to Nepal and India over Nov 9-16. The aid money is designed to strengthen project to universalize access to quality health services, and especially to end preventable child and maternal deaths, and create tuberculosis-free communities for Tibetan refugee communities in India and Nepal, a US embassy release earlier said on Nov 14. Tuberculosis remains the most pressing health problem for exile Tibetans, with the rate of infection among them being probably the highest in the world. Data from Tibetan Delek Hospital at Dharamshala, which runs the Tibetan tuberculosis project, show that the number of Tibetan infected with the disease was 202 in 2012; it rose to 228 the next year. Currently there are 150 undergoing treatment, with eight of them suffering from MDR (multi-drug resistant) TB. The rate of infection among the 16,000-18,000 exile Tibetans in Dharamshala – at one out of every 300 – is said to be about 65 times higher than in the US and twice the rate of TB infections in India and China. Surveys by India’s health ministry is said to show that while the national TB prevalence is about 168 cases per 100,000 Indians, the exile Tibetans have a rate of nearly 500 per 100,000 people. The World Health Organisation (WHO), quoting a study conducted in 2007, says rates of TB among Tibetan refugees in Himachal Pradesh are estimated to be between 400 and 800 per 100,000 people, with MDR TB present in 8-10 percent of patients. Over half of them were students, monks and nuns; 75 percent were less than 30 years old. The Tibetan Health System Capacity Strengthening Project, which is financed by the United States Agency for International Development (USAID) and implemented by The Tibet Fund, New York, will look to use innovative private sector partnerships to develop technology solutions to improve the efficiency and cost-effectiveness of health care provision for refugee communities.